"The idea is that my alter ego that allows me to conquer stage fright is this person called Shockwave Supernova," Satch explains. "I found myself on stage playing with my teeth and having a great time and I stopped and wondered who was making me do this, what do I become when I'm on stage?" "During this record he realises his run is over. On the very last song he realises he is saying goodbye to himself and he has to become something better. That's my lofty explanation!" 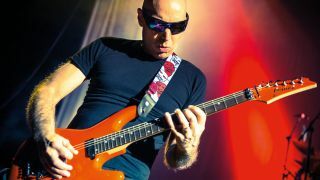 If that wasn't quite brilliantly bizarre enough for you, wait until you hear that Satriani's dental bill was one reason for the rise of Shockwave. "I was telling myself, 'Don't play with your teeth anymore, your dentist is going to kill you.' Then I found myself on stage in Singapore playing with my teeth and having a great time and I stopped and wondered who was making me do this, what do I become when I'm on stage? I'm usually a very mellow guitar player but once I'm on stage, I become someone else." Of course, Satch has the technical prowess and songwriting skill to be able to pull off such a bonkers concept. The record has been rapturously received, and the chrome-domed shredder heads to the UK this November, where he'll be joined by some familiar friends. The 2015 Satriani band features Marco Minnemann, Bryan Beller and Mike Keneally, the same group that recorded the bulk of the album and also toured together on the Unstoppable Momentum jaunt. "It was an obvious choice," he says. "When we hit the road last time we were new to each other. It took me over a year of touring to scratch the surface of the talents that Marco, Bryan and Mike have at their disposal, and how I might be able to take advantage of that in the studio." Choosing his bandmates may have been a no-brainer, but it would seem that pinpointing the gear to bring out on the tour is a trickier decision. "On stage, I'm often representing five guitar parts in one performance. The title track of the new album features two electric 12-strings being played with a slide as well as six-string guitars playing melodies and solos - how am I gonna do that, right? I've found this cool [DigiTech] box called Mosaic that emulates the sound of the 12-string being played through a Marshall. I jumped on that. "As for guitars, I'll bring the orange [Ibanez JS2410] and the purple [JS2450] and one of my JS25ART guitars. They're so precious to me that I'm almost afraid to take them out of storage, but I get a perverse thrill of looking down and seeing those crazy drawings."